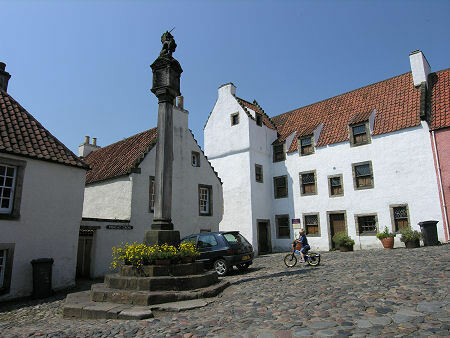 Why should you visit Culross? Located on the Firth of Forth, 12 miles west of the Forth Rail Bridge on the south-west coast of Fife, the Royal Burgh of Culross is one of Scotland’s best preserved 17th-century villages. If you are a fan of Outlander, Culross (actually pronounced ‘coo-ris’ not ‘cull-ross’) is the base for the fictional village of Cranesmuir, where the buildings around the Mercat Cross square were painted blue for filming. Parts of the village, including the Palace, are now owned and managed by the National Trust for Scotland, who are doing a very good job indeed of keeping the village as a perfect snapshot of a 17th-century Scottish village, albeit one that has been modernised and cleaned up for the 20th century. Despite Culross proclaiming itself a royal burgh with its own Palace, no king or Queens has ever lived in Culross. The honour of the name actually comes from a descendant of Robert the Bruce; a wealthy local mine owner, known locally as Sir George. By developing a magical (well it was revolutionary at the time) under the Forth mining technology, he made rather a lot of money and built up the village you can still see today. The ‘Palace’ was his rather impressive home. King James IV, seeing taxes galore, promptly made the village a Royal burgh. There are few place in Scotland that don’t benefit from a little sunshine to brighten things up, but the village of Culross, in Fife is not one of them. This historic burgh seems to suits the winter weather, the characterful buildings and winding streets seem to hunker down against the lashing wind. Toasties and soups are served at the Biscuit Cafe (above the Pottery Shop in the picture above). Food is also served at The Red Lion & at the Palace Cafe in summer. Oh, I do love a National Trust trip – definitely one to add to my summer list! I loooovee villages like that!! Your photos are soo pretty. I am a fan of Outlander haha great to know it was filmed also in Culross 😀 I hope to visit it someday! Lovely pictures – such a nice reminder of my time living in Scotland! What a pretty little village. It looks very damp and cold!